I have a folder, c:\websites\test, and it contains folders and files that were checked out from a repository that no longer exists. How do I get Subversion to stop tracking that folder and any of the subfolders and files? I know I could simply delete the .svn folder, but there are a lot of sub-folders in many layers. Also, if you are using TortoiseSVN, just export to the current working copy location and it will remove the .svn folders and files. In Subversion 1.7 the working copy has been revised extensively. There is only one .svn folder, located in the base of the working copy. If you are using 1.7, then just deleting the .svn folder and its contents is an easy solution (regardless of using TortoiseSVN or command line tools). And then just delete the old working copy. TortoiseSVN also has an export feature, which behaves the same way. If you are running Windows then you can do a search on that folder for .svn and that will list them all. Pressing Ctrl + A will select all of them and pressing delete will remove all the 'pesky' Subversion stuff. and the .svn files will be removed in situ, leaving the other files as is. Very convenient and less prone to clutter. -f = force, avoids a lot of "a your sure you want to delete file XY". None of these answers was satisfactory for my situation. I'm on subversion 1.8 and I had a working copy that only had a single .svn folder at the very first folder, root. However, I wanted to remove some branches from working copy. No matter what I did, whenever I ran an 'update' it would restore those files and bring them all back. I didn't want to remove them from the repository, just from my computer -- but I needed to keep the rest of the working copy in tact (thus couldn't just remove the .svn folder). Beginning with Subversion 1.6, you can take a different approach. First, check out the directory in full. Then run svn update --set-depth exclude on the one subdirectory you don't care about. All files under version control will be exported. Double check to make sure you haven't missed anything. 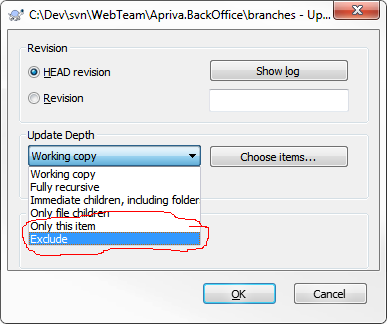 Just remove the .svn folder inside the required folder then the control will be automatically removed. This will add an item called "Delete SVN Folders" to your right click menu. This will delete all .svn folders in this folder and all subfolders. For those using NetBeans with SVN, there is an option 'Subversion > Export'. On Windows 7 one can just open the project folder and do a search for ".svn" if hidden files are enabled and delete all found .svn folders. The answer is surprisingly simple - export the folder to itself! TortoiseSVN detects this special case and asks if you want to make the working copy unversioned. If you answer yes the control directories will be removed and you will have a plain, unversioned directory tree. If you think that you could win with a simple magic command you are failed! SVN is really tricky and always come back somehow with a new error message in Xcode. Sooner or later, promise... so you have to do it smart! As you know the regular and best practice under Xcode is deleting a file on the project pane on the left. If you missed it and somehow deleted it in Finder you are in trouble. Big trouble! But you could solve it and spare time if you do it well. command which list your files. This will delete the file from the SVN repository, BUT you have to delete it manually in Finder. My idea is to remove the .svn folder and then move all other files to a new folder. It is as simple as that. When you are using the Windows OS, go to your folder location and check hidden files are open, and then you can see the SVN folder in there. Just remove that folder. It removes it from your local repository. As a vital point, when you use the shell to delete .svn folders, you need the -depth argument to prevent the find command entering the directory that was just deleted and showing error messages like e.g. "find: ./.svn: No such file or directory"
On Windows 10, we need to go to Windows Explorer, and then go to View and check the checkbox for View hidden files. Then navigate to the folder that has the SVN linked on Windows Explorer and delete the .svn folder/file. Subversion: how to remove all .svn files recursively? how to break SVN Link of project?